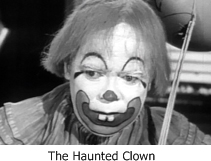 “The Haunted Clown,” an episode of the series One Step Beyond: Imagine Of Mice and Men‘s Lenny as the sorriest-looking clown you’ve ever seen. Now imagine that the girl he fancies with evocative jazz score and what you’re left with is this tragic and bizarre 1960 melodrama. The Plot Thickens: Who killed the seer during the séance? That’s the question in this bizarre little whodunit where a quiz show panel that includes Groucho Marx query the suspects and try to guess the killer. Horror maestro William Castle created this 1963 one-off that blends murder with the celebrity panel game show format of What’s My Line? or To Tell the Truth. “The System,” an epidsode of the series Danger: In one of his earliest filmed performances, a pugnacious Eli Wallach is a “grease monkey” who refuses to listen to the smitten cigarette girl (Kim Stanley) who warns him that he’s more likely to take a beating or worse than beat the house when he tries to win big at the casino. A 27-year-old Sidney Lumet directs. “Four O’Clock,” an episode of the series Suspicion: E.G. Marshall is a jealous husband whose plans for getting even with the wife he’s certain is having an affair take an unexpected turn in this compact thriller based on a Cornell Woolrich story. Alfred Hitchcock’s first foray into directing for television also features a young Harry Dean Stanton in a small, but memorable role. 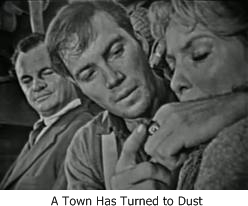 “A Town Has Turned to Dust,” an episode of Playhouse 90: In a town suffering a terrible drought, Mexican immigrants become a scapegoat leading to grotesque tragedy. John Frankenheimer directs a Rod Serling script that still has pointed things to say about xenophobia in the U.S. 53 years after its original 1958 airing. Rod Steiger and William Shatner star. Legends of Horror Go Noir! : The October 3rd program is devoted to horror’s classic stars. It is a sublime experience to watch Bela Lugosi, Lon Chaney, Jr., Boris Karloff, Vincent Price, and Peter Lorre each take their turn in the spotlight. “The Night America Trembled,” an episode of Studio One: Orson Welles’ infamous War of the Worlds radio broadcast is both dramatized and put into context (by Edward R. Murrow, no less) in this tantalizing production for the classic drama series. James Coburn (his on-screen debut), Vincent Gardenia, Warren Beatty, Edward Asner, and Warren Oates are among the cast. 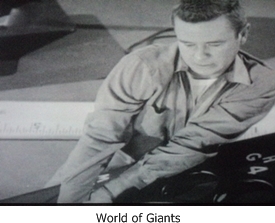 “Secret Agent,” an episode of World of Giants: The premiere episode of this short-lived series introduces Marshall Thompson as Mel Hunter, an American spy reduced to only six inches high after an unfortunate brush with radiation. Or maybe not so unfortunate, since even though he’s so tiny that he could be killed by a falling pencil, his neat petite size makes him perfect for certain covert operations. Just watch out for that cat! 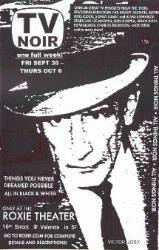 TV Noir plays Sept. 30-Oct. 6 at the Roxie Theater, 3117 16th Street, San Francisco. For further information, visit http://www.roxie.com.